young man’s tragic death across the Baltic, which is the one I choose to weave. Our summerhouse was in the area, and I saw the monuments as a little girl. Description: Its not about being against somebody but being together at hard times. So many Countries have been going through brutality when we do not deserve it. Muslims or non-Muslims does not matter, Humanity matters. This isn't war because war suggests both sides standing equal chance of winning and clearly, we are the stronger side as we have God on our side. Innocent people dying doesn't show that we are weak but simply shows that this World is a temporary place and the best thing is to return to Allah (one n only God). May God bless us all. Ameen. Description: The hamsa, or " Hand of Fatima", symbol of protection, is taken from a old cell phone, and guards us from evil on our way. The silver tray evokes the gracious rituals of domestic life, while other elements speak to the winds of change, the long journeys we have had to take and nostalgia for homes we have lost. Description: Sharing food and hospitality is surely the oldest and most direct way of establishing connection between peoples. The samovar is a vessel for heating water, around which peoples of the Middle East and Eastern Europe have for centuries gathered to warm their body and spirit with hot tea. The serving tray is an object of domestic life that provides a support, frame and vehicle for the creation of images. I serve up this image of the samovar to remind us that where words can fail, a cup of tea can still reach. 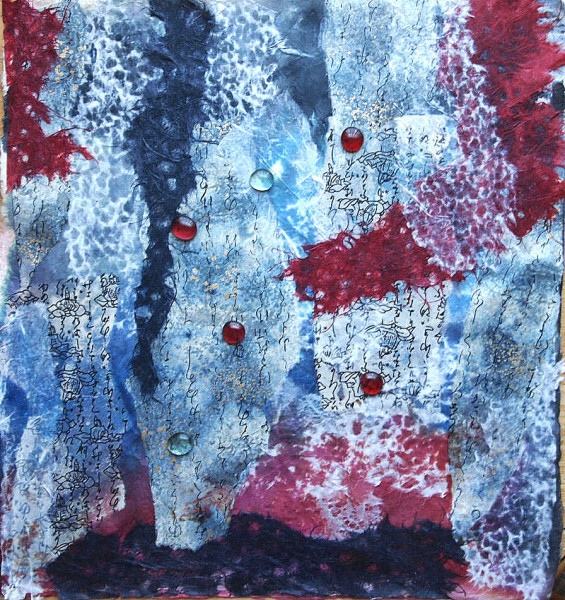 "Diversity" l 18" X 20"
Description: I was inspired by my love of Japanese culture, and Japanese gentleness and spirituality. I did not intend it during the process of creating the piece, I was only choosing colors of paper along with the Japanese script paper, that went with the background I had laid down on a stormy day. And what the piece turned out to be, was a mix of Japanese culture and spirit, mixed with the American patriot colors of red, white and blue. The piece is ultimately about diversity, respect of both Japan and the US, together. Description: In Flower and Bird 2 (Gul o Morgh 2) the story of a bird is intermixed with the flowers and plants and vegetation. 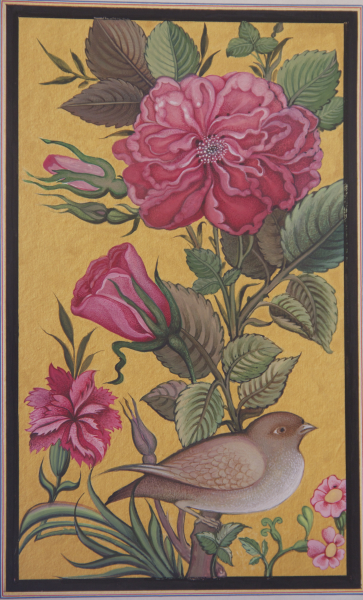 Flower and Bird are motifs in Persian Art. This theme has been illustrated by Persian artists in epics and romance for a long time. I recreated a scene that shows Love and interactions between the bird and the flowers. Happiness and existence of one depends on the other. The Golden background and the perfection in depicting each part of this painting refer to the idea of paradise that Persian Artists have cherished for a long time. 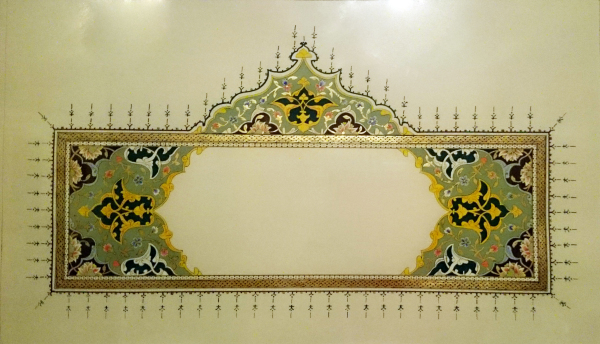 Description: Shamsee is one form of Islamic-Iranian art that has been used to illuminate religious texts especially Quran. 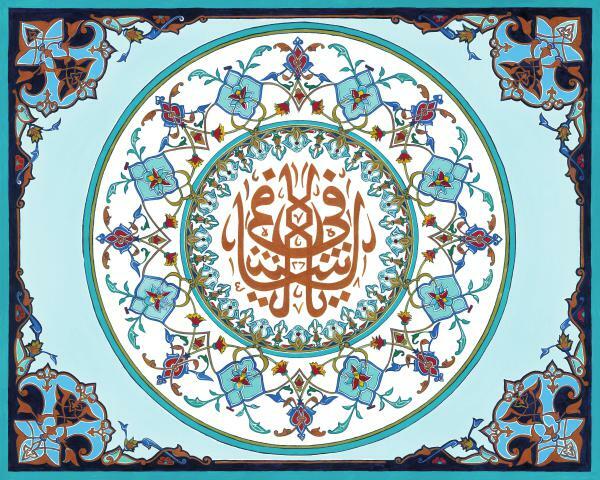 Shamsee means sun and traditionally Persian Artists put a word, phrase or verse in the center. I have placed Symbols of Christianity, Islam & Judaism in the middle of Shamsee. The ideal world is created by decorating the co-existence of these three religions by abstract plants and flowers. Description: Africa: The cradle of humanity, the land of origins and beauty in simplicity, and the birthplace of many faiths. 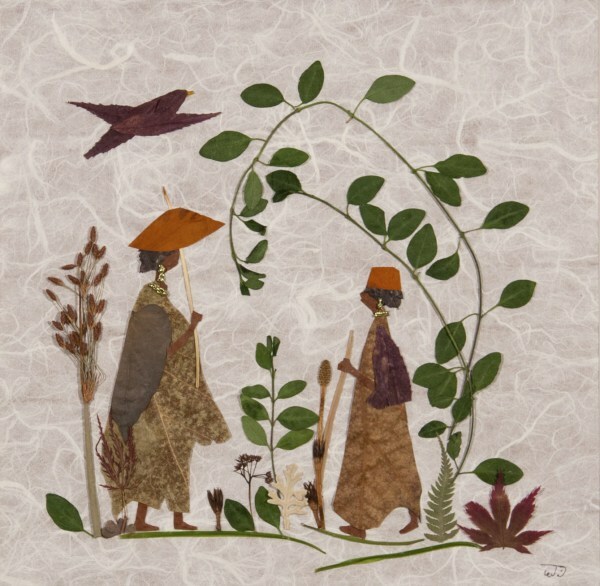 The artwork displays two African villagers conversing in the midst of nature. Material used in the creation of this artwork include: Japanese maple, Moss, Dryopteris, Platanus, etc. The artwork shows a group of African villagers standing in awe of the beautiful African sunrise. 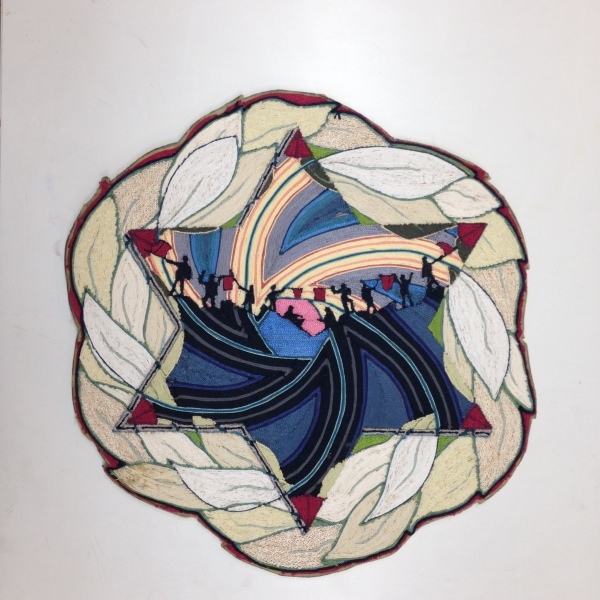 Material used in the creation of this artwork include: Palm leaves and fiber, etc. " 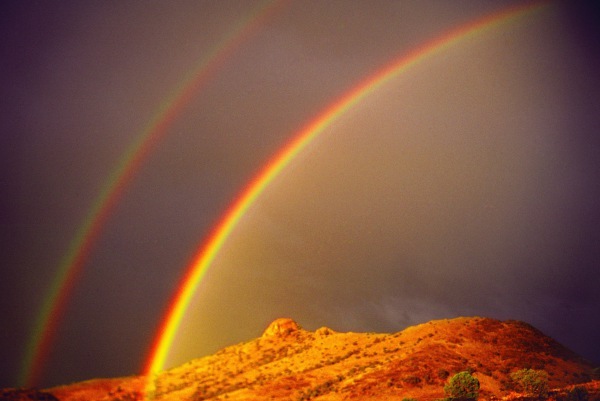 Description: The first year (1997) that I attended an all-race American Indian Sun Dance ceremony we all witnessed a perfect double rainbow near sunset after the first day of dancing. A good omen for the intentionality of the Dance, organized by a direct decedent of Black Elk at his mother's request, to further the healing between peoples of all races, and in particular, American Indians and Europeans. I had a few shots left in a camera roll, and was able to record this beautiful rainbow. Description: My giveaway for the 2nd year of our Sun Dance ceremony, reflecting the perfect double rainbow we all witnessed on the first year. It shows symbols from all races and creeds within the shining sun, and my "signatures" on the bottom. 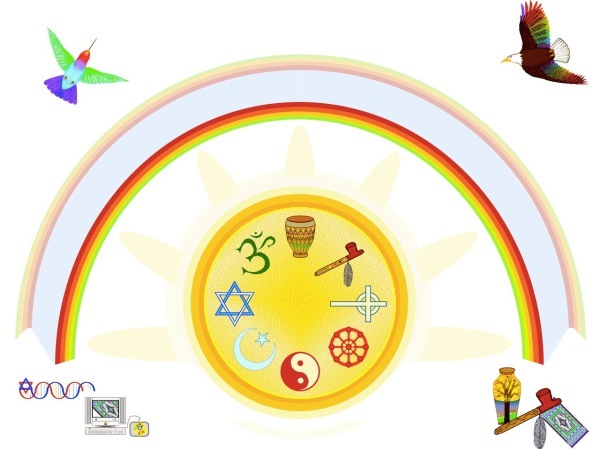 I had seen various graphics showing symbols of different religions within a circle, but was unhappy that they showed just more developed asian/western religious traditions, and ignored the Americas and Africa. 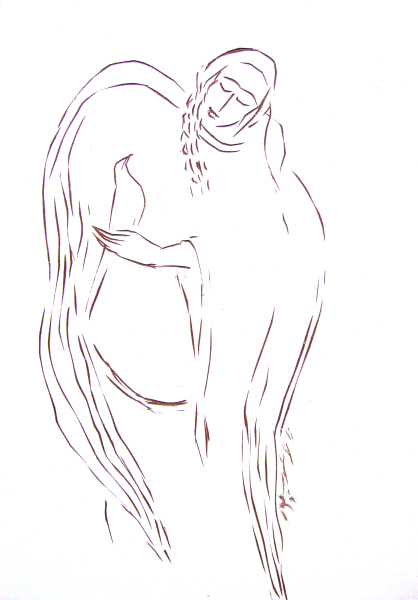 So I drew mine with an African drum top center, and the peace pipe next. May all peoples live together in harmony, warmed, illuminated, by the radiant sun! Description: Frustration is a factor in creating art as well as in resolving conflict. But the heat/fire can be transformed into the heaven/light of fellowship. Hexagram 13 of the I Ching, interpreted as Fellowship/Heaven Over Fire, epitomizes what's needed for interfaith reconciliation. It is obvious that cooperation is advantageous, but the darkness of suspicion and mistrust can undermine community spirit. True and lasting fellowship must be based on a mutual concern that is universal, one that furthers the goals of all human beings, not just private interests. 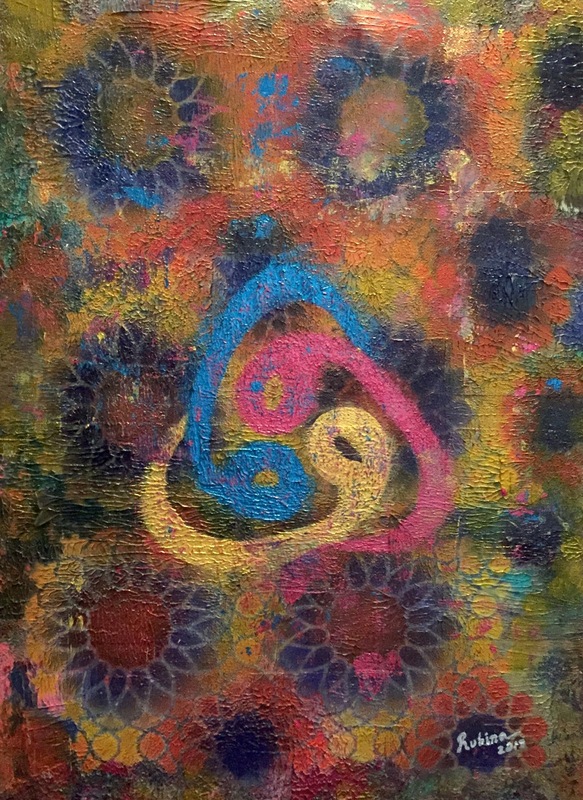 Description: In his artwork Bazargan envisions his thoughts on oneness of human beings and the fact that all faiths are facing toward one truth, the true beloved. Whether you call this truth God, Allah, Yahuwah, or name it something else, the name does not change the truth. If we believe that we are all believing in one truth and praying toward him, we can arrive to peace and harmony among faiths. 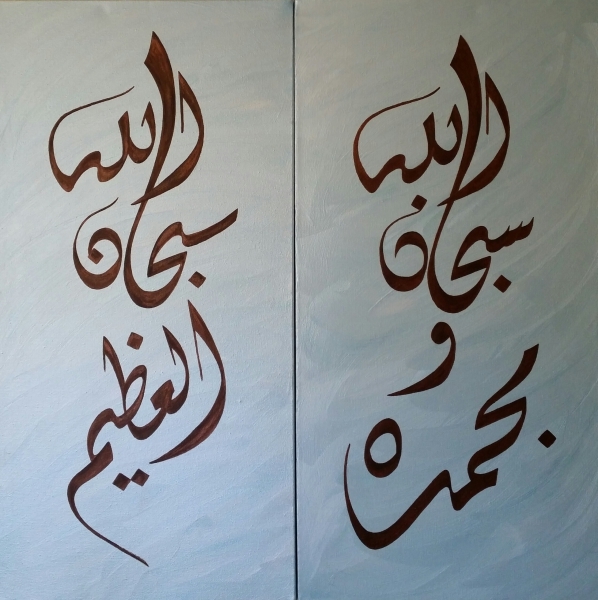 Navid’s style combines calligraphy and painting with different styles of the graphic arts. Description: "Glory to God and all Praise to Him" and "Glory to God, the Supreme". These are the one most powerful Arabic phrases used for Remembrance of God throughout the day. Anytime God is remembered, it brings calmness and contentment to the person. That person can then be in a state of acceptance and empathy for others around him. They can bridge the gap between humanity through their own selves that otherwise can be difficult to fill. Muslims frequently repeat these two most beautiful phrases in order to be aware of God's presence all through the day. Description: Quran: The Merciful (55:60) "Is the Reward for Excellence anything but Excellence". As humans we have a need to be appreciated and rewarded for our good deeds. God is the most Generous and Merciful in His blessing no matter who is at the receiving end. He has endless treasures to give and the Reward He gives cannot even be fathomed by us humans but our belief in Him has to be strong. When the expectations of Reward are from God we can work selflessly towards the goal of helping humanity. The goal of being a bridge which brings people together and makes the distances shorter. The goal of peace, love and generosity for all around us. Description: The warmth of the heart creates a refuge for all who are wronged. The inspiration for this work is a lazy afternoon inside a mosque. The creator provides a safe haven inside the hearts from all the chaos outside. The inscription is 'Allah hu Akbar ' God is great in Arabic. Description: The freedom is a sacred bird gifted to human beings and in order to come out of darkness and build a bridge towards understanding and peace among various nations and faiths, we must free this bird again and do not capture others’ birds. Description: My sexuality was discovered at the age of 20. 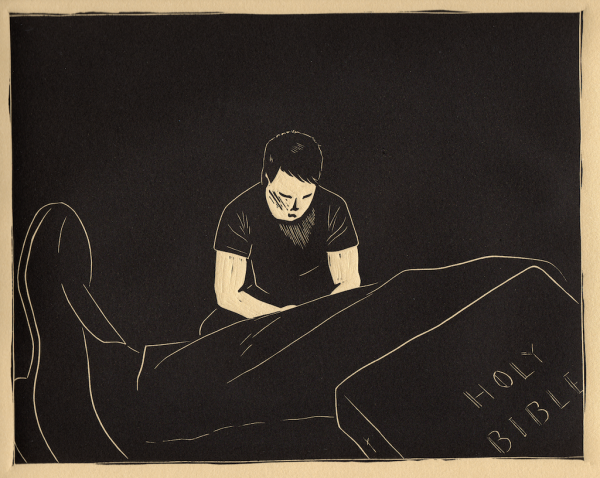 I had a choice: I could confess to the Elder, or be reported. I chose the former, and sitting across from him that evening I knew that every doubt I’d had about spirituality was coming true. All I felt was shame, isolation, and judgement. I was able to understand that experience better in 2013 after I had returned to a faith community and began to feel their acceptance, support, and faith. From that vantage point, I was able to reflect on a painful experience and understand how it shaped me today. 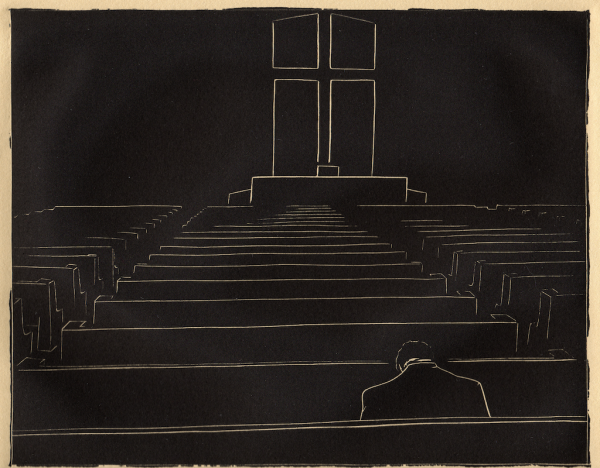 Description: As a closeted young man living in Indiana, I worshiped weekly with almost 1,000 other members. I was surrounded, and felt completely isolated at the same time. Today when I enter a house of worship, I find solitude, solace, and calm from sitting and meditating quietly with my head bowed. I am aware that from the outside, my solitude may look like the isolation I felt as a young man being excommunicated. 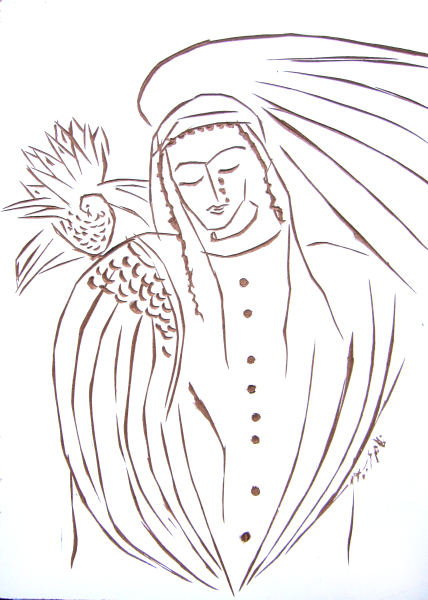 Whether the figure is experiencing solitude or isolation is up to the viewer; they are both parts of my faith story. Description: Al Fatihah is the opening prayer in the Holy Qur'an. It is also recited during each Salat, (prayer) The prayer has always represented "the Beginning" to me. al Fatihah seemed so appropriate to show as I see it as a beginning of worlds and races and religions beginning to work and come together for a Greater cause, The Cause of Allah/God. Description: Ya Shafi, or The Healer, refers to Allah/God being the Healer of everything and All. I felt this would be appropriate to show as there is so much healing needed in the world today. Pain and suffering have no prejudice. They can enter in to anyone's lives in an instant, regardless of race, color, belief, religion. Are we not all in need of Healing? X-STYX-X l 8" x 13.5" x 8.75"
Description: X-STYX-X, was a finalist entry for the Cartasia 2012 Paper Festival in Lucca, Italy where the theme was Crisis and Rebirth. X-STYX-X refers to crossing the river Styx to the land of the dead and crossing back to rebirth. Reminiscent of Dante Alighieri's image of Hell, Purgatory, and Heaven in La Divina Commedia, the sculpture portrays the movement from crisis to rebirth. An individual's crisis may consume him/her, drawing him/her into the depth of despair, until one can go no deeper. At this point of acceptance one experiences a rebirth and a flowering of new life. 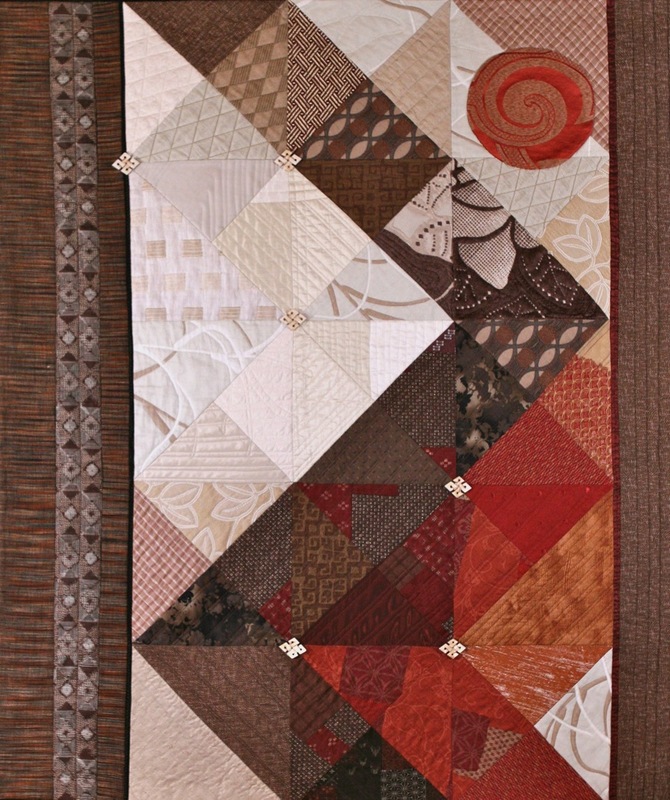 Uji l 12" x 22.5" x 11"
Description: Uji is named after the Uji bridge in Japan that crosses the Isuzu River to the Ise Shrine, the most holy shrine in Japan. The bridge, like the shrine is rebuilt every 20 years. By tradition, those who cross the Uji bridge enter the sanctuary. 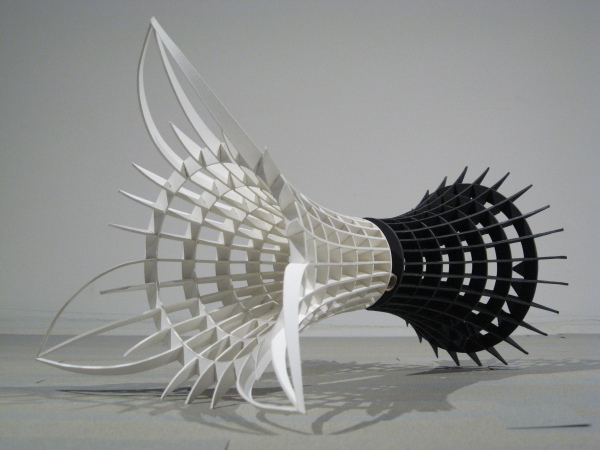 This sculpture explores transcendence from the earthly realm to the spiritual. 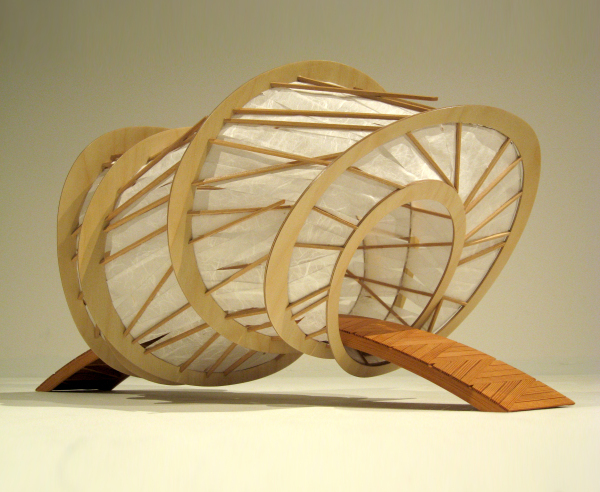 The enfolding translucency of the wrapping soji screen provides a cocoon for the transformation from being to rebirth. 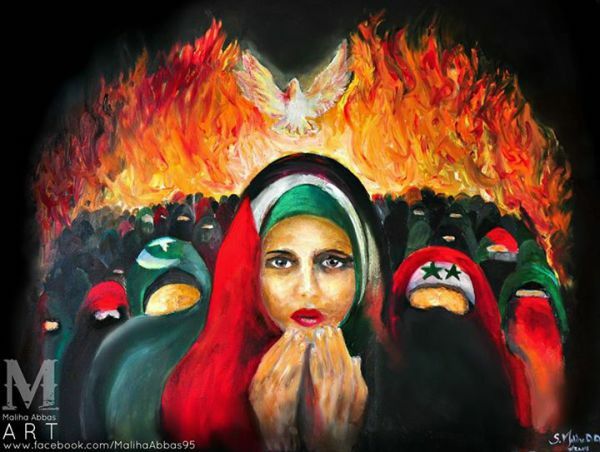 Description: In my early 20’s, I had the privilege of living in a Muslim country for two years as a Peace Corps volunteer. More recently, I lived in Catholic Spain for one year. These experiences as well as my membership in Kehilla Community Synagogue have provided me with a worldview that sees a oneness in all things. 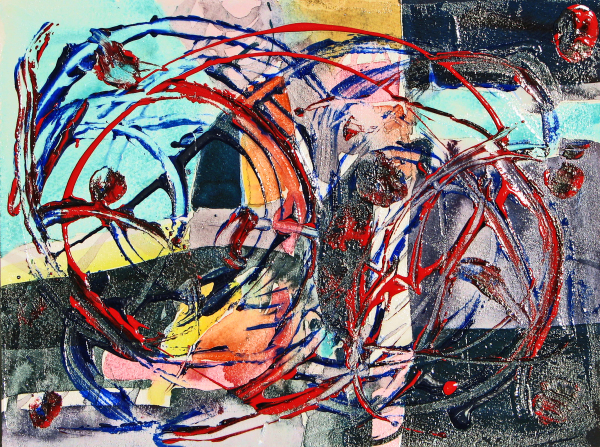 My recent abstract works reflect my feelings that we are all connected. Our actions are like waves touching all things. I appreciate Kehilla’s participation in the Faith Trio, and the opportunity to be part of our joint art shows. 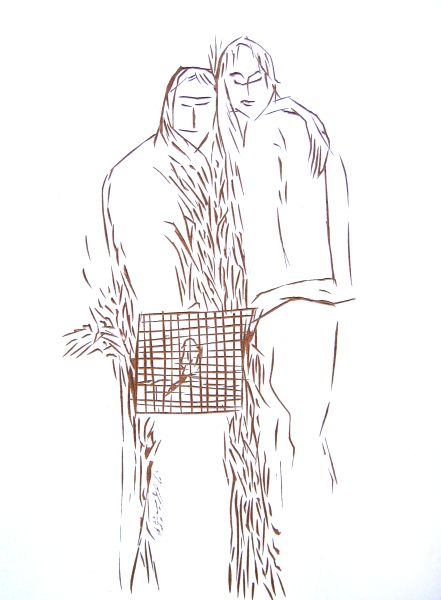 Description: "In the Beginning" reflects my feelings that we share a common origin, a common humanity, a common world. 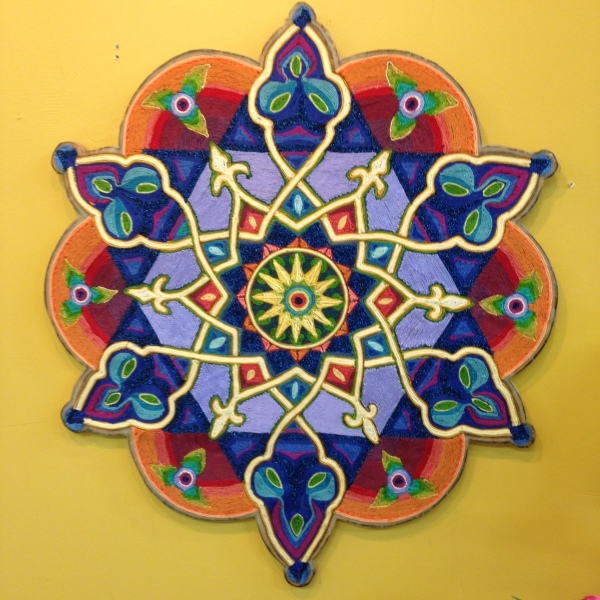 "Deviation" l 18" x 18" x 1/2"
Description: An Islamic Arabesque is layered with the Star of David and the blossoming Lotus. They are integrated into a hopeful and positive image - This is my hope for a growing relationship of trust and peace between nations and peoples. 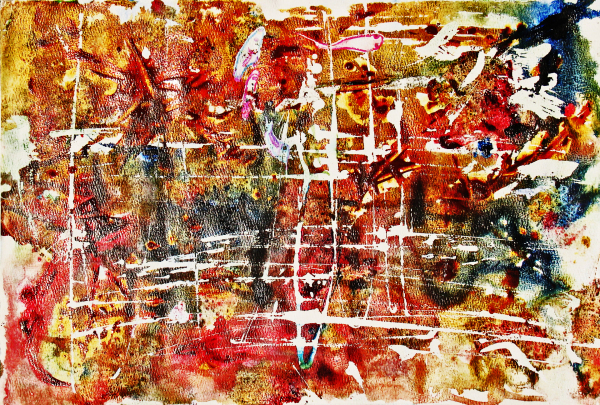 "Lamillar" l 20" x 20" x 1/2"
Description: I simply love what Ayasofia stands for. 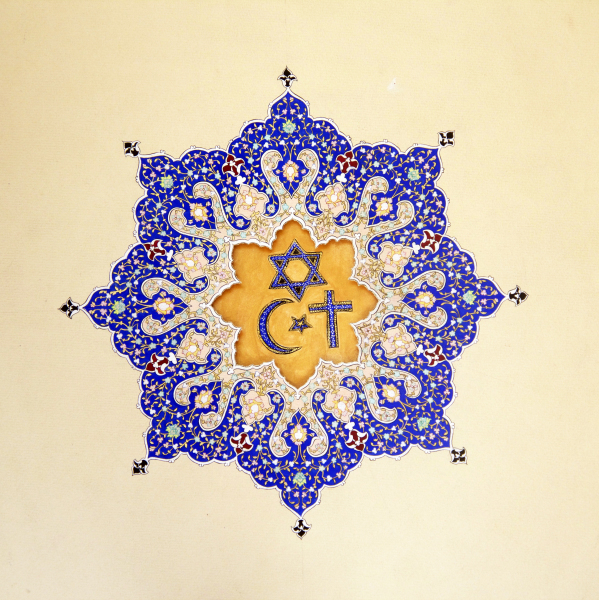 All religions are intertwined with each other to make this world a better place. Once a church later an imperial mosque, and now a museum Ayasofya is a chronicle of how we can co-exist. 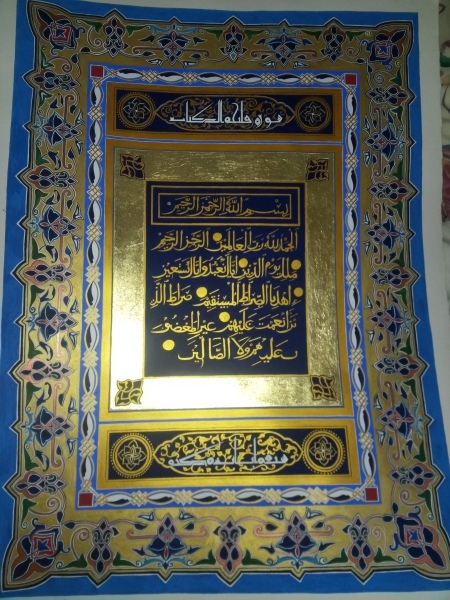 It has both paintings of Jesus Christ as well as scriptures from the Quran. This truly is a monument to religious tolerance. Description: In Arabic this letter is "WAW". The Modern Hebrew name for this letter is "VAV"
The letter "V" in English also comes from the Semitic letter "WAW"
"And" - Arabic letter "WAW" is called the letter of love for it is the place of meeting between two things; if it wasn't for waw, things would not be able to come together. 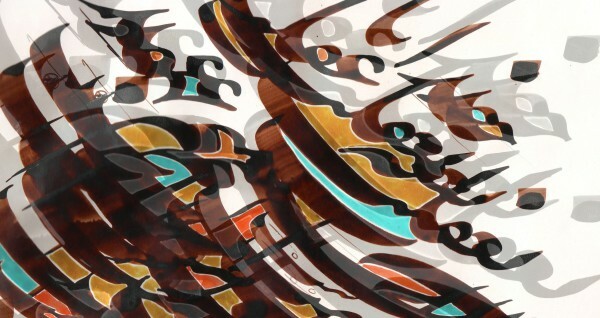 Hence, it is the letter of Love in Islamic calligraphy. In Hebrew the meaning of this letter is to add or secure. 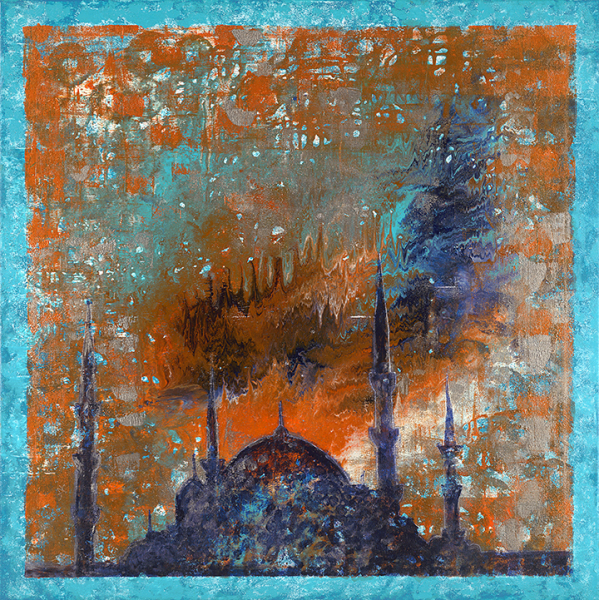 WAW in this painting is represented in three different colors symbolizing different faiths. They are interlaced together to create a heart depicting we are all one WOW together.